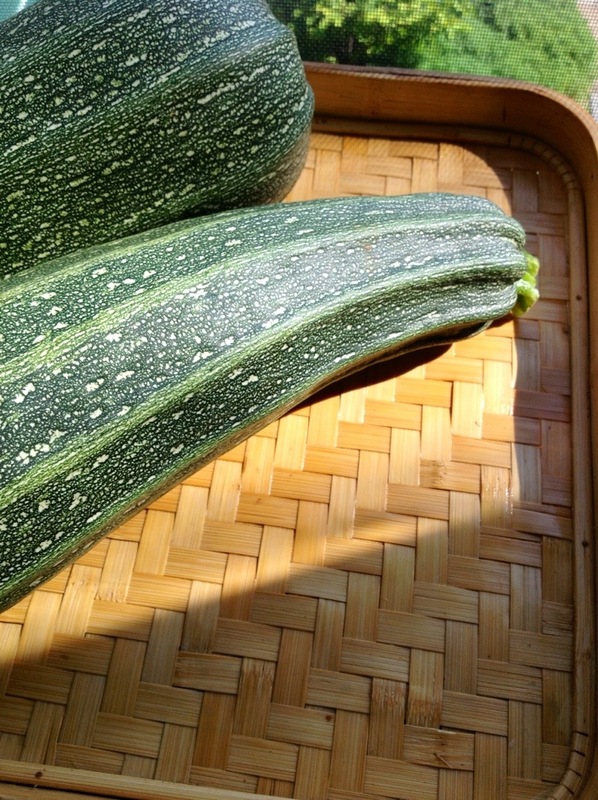 I was gifted with two enormous zucchini from a local gardener. When I heard I was getting two, I thought, how nice, how restrained, just a sample. I went to pick them up, and I think they must be three pounds each, maybe four. A few days ago, I made, with now what I must now call petite zucchini, linguine from Heidi Swanson’s book, Supernatural Everyday, a cookbook I received after reading at Brookline Bookstore. It calls for wringing or squeezing water out of shredded squash, which is much easier than, say, to do with a stone. The result was delicious. Now I tempted to make her spicy zucchini bread but I must wait until midnight, when it has cooled off enough to turn on the oven. Whenever I think about cooking at midnight, I am reminded of a poet, Pasquale Verdicchio, who taught several of us how to make Midnight Pasta, a dish so simple, and so heavenly that it needs a magic hour for its own. I had thrown a party, in San Diego, and we were all mildly stunned with drink, so that we needed the fortification of restorative pasta. To learn how to make it, you need a party, spaghetti, garlic, olive oil, red pepper flakes. It sounds like another pasta dish, but it isn’t. The other day, when I couldn’t sleep, I remembered an ayurvedic recipe from John Douillard’s website, which I made, since the only party I was at was on Facebook. It might be better mixed in a blender, so you you don’t need to spoon up the dates and almonds, but it did the trick. I have two fans going on now. It is nearly 5:00 PM. Seven hours to go. So these are what we’d call zucconne, rather than zucchini. Maxi , not mini. Abbondanza! What a lovely letter, thank you! Your new job sounds wonderful, and I’m thrilled for you. The website looks good, and I’m glad you are working with generous-spirited people. Summer linguine by Heidi Swanson is simple. The hardest part is squeezing the shredded zukes with your hands to get the water out. So, shred 2-3 zuchinni, and place in a colander over a bowl,and sprinkle with salt. Cook 8 oz of pasta. Drain, but save a little of the cooking water. Heart 2 T olive oil in a large saucepan, and heat i large clove of garlic, thinly sliced, and 1/2 t red pepper flakes. Squeeze out zucchini and add to pan. Cook until tender, about 2 minutes, stirring frequently. Add the drained pasta, and add the water if it seems dry. Toss well. Add 1/2 cup grated parmesan and 1 T butter, and toss again. Season with salt & black pepper & divide among 2-4 bowls. Top with more cheese if you like. In India, hard cheese is pretty rare, and I don’t know what it’s like in South Africa. I think instead of cheese, you can add fresh tomato, and basil. I sometimes use yogurt as a sauce of pasta, and pretend it’s Russian. Let me know if it turns out okay.